Hungarian composer Gabor Presser claims he wasn’t properly compensated for a sample used at the end of the track. Hungarian Composer Gabor Presser is suing Kanye West over a sample used on Kanye's Yeezus single "New Slaves", TMZ reports. Presser claims that Kanye reached out to him in 2013 to get permission to use the sample, but a formal deal was never reached. Kanye gave Presser a $10,000 check, but the check was never cashed, according to documents obtained by TMZ. Now, Presser is suing for $2.5 million. 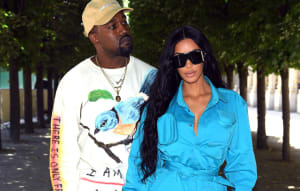 Earlier this year, angry fans sued both Kanye and TIDAL, claiming that they were tricked into signing up for the streaming service under the guise that The Life of Pablo was a TIDAL exclusive though it was released on other streaming services shortly thereafter. Representatives for Gabor Presser and Kanye West were not immediately available for comment.